This distinctive 3 Carat Halo Engagement Ring is encrusted with brilliant pave set diamonds totaling just over 4 carats. The square European-style shank is crafted as a split shank halo engagement ring, with intricate diamond rows and scrollwork detail decorating its halo engagement ring setting. 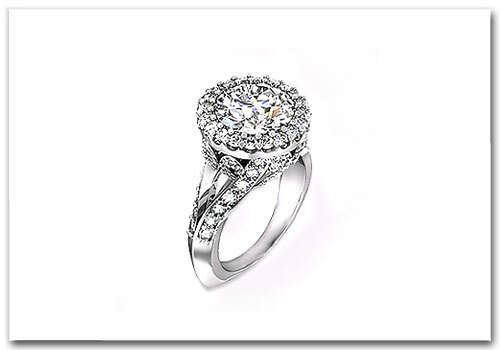 The impressive 3 Carat Halo Engagement Ring can be custom made with the diamond center stone of your choice. Our diamond halo engagement ring is available in platinum and 18K yellow gold, with a platinum halo setting - RD104-1.